In Part 1of this topic I described how a T1 carrier is used to transmit data. Data transmission by nature is "bursty" meaning large amounts of information are typically transmitted and then followed by relatively quiet transmission periods. This can cause transmission problems for T-carrier systems since they rely on timing synchronization. Let's take a look how this potential problem is avoided. T-1 lines that are not constantly active (having binary 1’s) will have timing problems because actual pulses are also used for signal synchronization by the receiver. To add synchronization on “quiet” T-1 lines a technique called Bipolar with Zero Substitution (B8ZS) has been developed. 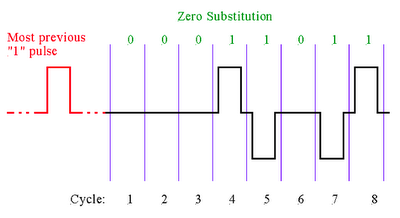 B8ZS adds pulses by substituting 8 zero bit groups with one of two specific 8 bit codes. 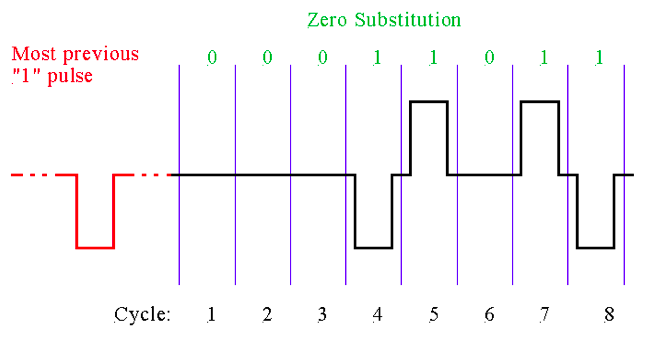 When the transmitter gets a string of eight zeroes and the most previous “1” pulse was a positive going pulse the following 8 bit pulse sequence is substituted for the eight zero sequence. Notice there is a bi-polar polarity discrepancy in this substituted pulse sequence. 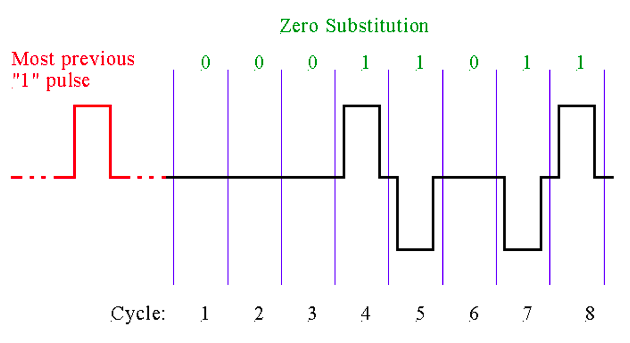 Pulses 5 and 7 are sequential “1” pulses and are both negative going – they do not alter in polarity. 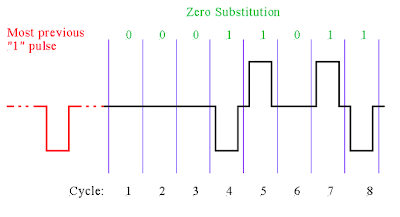 When the transmitter gets a string of eight zeroes and the most previous “1” pulse was a negative going pulse the following 8 bit pulse sequence is substituted for the eight zero sequence. Notice there is also a bi-polar polarity discrepancy in this substituted pulse sequence. Again pulses 5 and 7 are sequential “1” pulses. In this case they are both positive going and do not alter in polarity. T-1 receivers can detect both of these bi-polar polarity discrepancies and substitute strings of 8 zeroes whenever one is detected.